The museum is split into several large buildings linked by an underground tunnel to get you from one side of the road to the other. The main building is the Great Hall which also contains the only Japanese bullet train outside Japan, a large area which is all about the way the Royal Mail has used the railways over the years and a small café. In the Warehouse which is joined onto the Great Hall you’ll find an exhibition all about the Flying Scotsman, although confusingly the engine herself is not located here as she’s being refurbished in the Workshop next door. What you will find in the warehouse are endless rows of railway memorabilia from the steam years right up to the present day. Under the tunnel, there’s a building containing a collection of Royal Trains from over the years and then outside is the South Yard, with yet more trains and locomotives to see. There’s also a gallery of railway art and a small ride-on railway to enjoy before you leave via the shop. 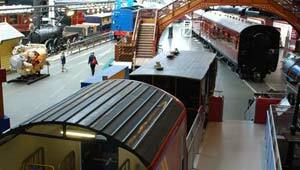 By its very nature, the National Railway Museum is not going to be for everyone, but we think you’ll enjoy it even if you only have a passing interest in trains or railway heritage. There’s plenty for kids to do and you can take it at your own speed. Admission is free but you will often be asked for a donation to enter. Remember this is optional! The National Railway Museum is open daily from 10am to 6pm. The National Railway Museum is located at the rear of York Railway Station. There are two entrances, one on the station side of Leeman Road and one further up on the opposite side of the road. The two sites are linked by an underpass within the museum.